A DVD for Dogs? Call Us Crazy. Um, yeah. About that… people often ask what on earth inspired us to develop a DVD for dogs (usually just after they comment “Hey, what a cool idea!”). The answer is simple: we love dogs! Sure, it’s a pretty nifty way to earn a living and we don’t hate that. But, our primary motivation for making this product was to invent something totally unique that you and your dog (as well as lots of other dogs and their humans) would truly enjoy watching. If you think about it, we humans love to share other forms of two-legged entertainment with our four-legged companions… so why not watching television? And not just any ol’ television… FleaTV actually is GOOD television! Everything we did while dreaming up and making FleaTV — the content… the presentation… the total experience… everything — was done with our furry friends in mind, and with them at our sides. So as a result, chances are that FleaTV is like nothing you, and more importantly your dog, have ever seen before. It’s like nothing we’ve ever seen before, and we made the thing. No other product acknowledges as FleaTV does that physically dogs see and hear the world differently than humans do. Their eyes are different, their ears are different, their heads are shaped differently, they are built lower to the ground… and that’s just for starters. FleaTV uses a proprietary blend of techniques (one that took more than a year to develop) to help capture and maintain your dog’s attention, and provide her or him with the most pleasurable viewing experience that we could imagine. While our exact formula is a secret, here are a few of the major elements that make FleaTV truly unique. Remember ROY G BIV from your school days? 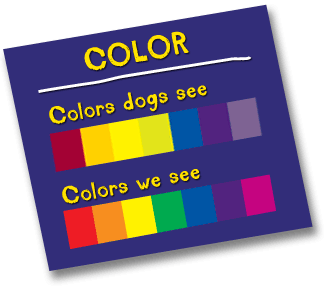 Let’s see… red, orange, yellow, green, blue, indigo, violet… It turns out that apparently dogs don’t see colors quite that way. Recent studies suggest that dogs have significantly fewer cones (the photoreceptor used for color vision) in their eyes than humans do. As a result, it would appear that dogs see color primarily in two hues: blue-violet and yellow (with varying shades of white and gray). Dogs may be unable to distinguish greens, oranges, and reds from gray, perhaps similar to humans who are red-green color blind. The video for dogs in FleaTV has undergone special color processing to emphasize blues, violets and yellows. The purpose: to make the viewing experience easier on your dog’s eyes, and to remind you that this video is meant for your dog, first and foremost. The video for dogs in FleaTV is shot almost completely from a dog’s perspective. Indeed, Blade (our actual dog), and his friends use exclusive BladeCam™ technology (made just for us) to show your dog a familiar dog’s-eye view of the world (a view that we must admit is pretty interesting to us humans). Please be forewarned, though, that you’ll see some (ahem) "things" that you might not be used to seeing so up close and personal. That said, we don’t think your dog will mind at all. Research suggests that a dog’s overall visual acuity—the ability to see something clearly—is not all that great. 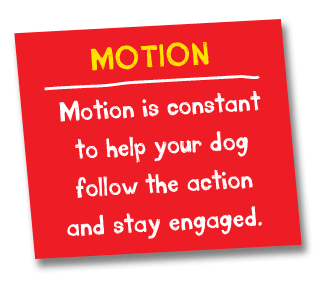 However, studies also have found dogs to have a keen sensitivity to motion; they can spot a moving object at great distances quite easily, even at night (a handy trait since dogs have extensive backgrounds as hunters and herders). What dogs may lack in cones (see Color above), they more than make up for in rods (compared to humans). Rods are the photoreceptors of the eye that help us (and dogs) see in low-light situations. You might think of them as built-in motion detectors, and dogs have a bunch more of them than we do. The video for dogs in FleaTV puts those rods to good use by making sure that the motion in the video is swift and constant, yet not overly detailed in terms of subject matter. Further, we’ve used a special motion-control technology (that we affectionately refer to as “The Box”... you'll definitely know it when you see it) to help minimize any motion sickness or discomfort to humans, making it comfortable for you to watch FleaTV alongside your dog without regurgitating your kibble. Let's see... lots of light-sensitive rods, fewer color-sensitive cones, relatively poor visual acuity, and a heightened response to motion all must mean that a dog’s vision is just ripe for responding to heightened contrast. That's right! There's even scientific evidence that the very structure of a dog’s retina makes it easier for dogs to see high-contrast images. So, we give your dog lots of contrast. 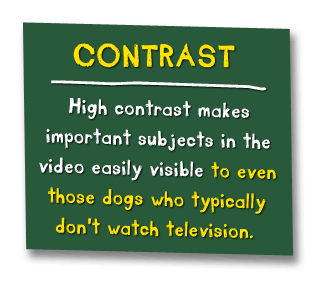 The video for dogs in FleaTV incorporates extensive contrast to help make it easier for your dog to see important subjects in the video. From time to time, we'll hear from someone who says that their dog doesn’t typically watch television. There are a few reasons why we believe that FleaTV may be a totally different experience, but one very important reason might just be the television itself. There’s evidence to suggest that modern flat-screen televisions are much more dog friendly than their older counterparts. In the “old” days (even as recently as five years ago), some dogs were perhaps bothered by their sensitivity to the television’s “flicker-fusion” rate. Without getting too complicated, flicker fusion is the point where the viewer (human or canine) perceives rapidly flickering light as one smooth continuous motion, instead of as a series of individual flashes. Flicker fusion occurs at a much lower threshold for humans than it does for dogs. So, older televisions (with lower flicker-fusion rates) didn’t bother people, but they sure would have bothered most dogs. Most current-generation televisions have flicker-fusion rates well above that threshold perceptible to dogs. (Most LCD TVs, for example, have refresh rates of at least 120 Hertz, and many higher than that. We know, we know… too technical.) The end result: a much more pleasurable viewing experience for your dog. Of course, in addition to more favorable flicker-fusion rates in today’s televisions, we also happen to believe that FleaTV offers something good that’s actually worth watching. We think your dog will too. We spent a lot of time working on the content for FleaTV. Sure, we could have just phoned it in, but then we would have felt terrible. (Believe us, we’ve been subjected to enough bad television to know.) Instead, we proudly (and doggedly) designed FleaTV with the genuine expectation of its captivating and entertaining your dog. The content on the DVD is organized into two sections: For Dogs and For Humans. With Blade acting as tour guide, your dog will take a number of playful, vicarious journeys to fun and interesting places. It's the next best thing to your dog being there live, (except, of course, you won't have to fuss with poopy bags). Your dog will get a first-person first-dog look at everything that catches Blade's eye on his various trips, all from his unique point of view. And even though this part of FleaTV is meant for your dog, we’d like to gently nudge you into watching it with him or her (especially the first time) so that you can enjoy the experience together. We can’t think of a better bonding opportunity. Here’s a quick rundown of the content. Blade and Lilly encounter a wide variety of four-legged friends at the dog park. Ever dream that you were taking a final exam for a class you totally forgot to attend... ever? Dogs have that same dream! Okay, not really, but here’s an interpretation of a dream Blade easily could have had. A pleasant stroll along Big Creek, complete with bicyclists, skateboarders, encounters with other dogs and even a few tadpoles along the way. A dash through the woods where all manner of living things pop up when you least expect them. Familiar sounds of city life blend with a casual walk down Main Street. When you have to step out, or if your dog kindly requests a little “me” time, choose this option to continuously replay all of FleaTV for Dogs. Sure, there’s stuff on this DVD for you, too. You are footing the bill, after all. In this section of FleaTV, you’ll find step-by-step demos for making five outrageously tasty (we know, we tried ’em) and healthful, homemade treats, plus tutorials on giving your dog a world-class massage. Ginger, our chef extraordinaire, guides you every step of the way in making tempting and healthful treats for your dog. Celebrate your dog’s birthday (or any other day, for that matter) by giving him or her a special treat to eat. If your dog is diabetic, or even if you just want to monitor what he or she eats, be sure to give this recipe a try. Your dog won’t find a more delicious way to beat the heat during those dog days of summer. Once your dog gets a taste of Blade’s Faves, there’ll be no going back to those ordinary, store-bought treats. This recipe includes wheat germ, which is super rich in vitamins and essential nutrients. 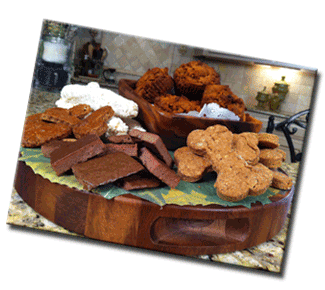 The added banana makes these treats chock full of true goodness for your dog. Marty, our licensed massage therapist, shows you easy-to-learn massage strokes to relax, soothe and pamper your dog. Can't you just see it? There you are... sittin' on the couch, enjoying a nice homemade goodie while you and your dog kick back and watch a little FleaTV... Isn't that vision of pure domestic bliss totally worth a measly 20 bucks?! Your dog has been waiting patiently while you learned all about FleaTV… now it’s time to reward your best bud by buying him or her the ultimate dog treat!